In March 2019, the NYU Stern School of Business Center for Sustainable Business and IRI® released the findings of a new U.S.-based study and established the Sustainable Share Index™, an in-depth analysis of consumer purchases of products that are marketed for their sustainable attributes. The research finds that sustainability-marketed products are responsible for more than half of the growth in consumer packaged goods (CPGs) since 2013. To view the full 2019 CSB Sustainable Share Index™ report, click here. Today more than ever, consumer packaged goods (CPG) companies are responding to changing generational expectations, including of more sustainable product offerings, yet the understanding of consumer purchasing trends is limited. 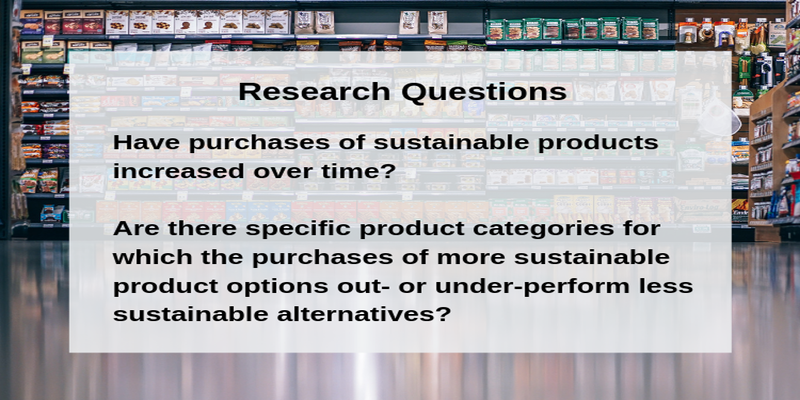 The CSB Sustainable Share Index™ research team sought to discover (A) how purchases of sustainable products have changed over time and (B) how these trends might play out among different CPG product categories. To conduct the research, CSB partnered with IRI, which contributed its comprehensive point-of-sale data on U.S. consumer purchases. CSB analyzed data from across 36 product categories, representing approximately 40% of total CPG sales, excluding tobacco and alcohol. The research conducted by CSB found that sustainability-marketed products delivered 50.1% of market growth from 2013-2018 while representing 16.6% of the CPG market in dollar sales in 2018. Across all categories, sustainability-marketed products delivered $113.9B in sales in 2018; +29% vs. 2013 and are expected to grow to $140.5B by 2023, based on an extrapolation of the analysis. Products marketed as sustainable grew 5.6x faster than conventionally-marketed products, and 3.3x faster than the CPG market. In over 90% of individual product categories examined, the growth of sustainability-marketed products outpaced total category growth. Sustainability-marketed products account for 16.6% share of market ($) in 2018, up from 14.3% in 2013. Sustainable products have more than 20% category share in many food categories, including cheese, salty snacks, and coffee. To view the March 2019 press release, click here. Please contact Randi Kronthal-Sacco, Senior Scholar, Marketing and Corporate Outreach at rkrontha@stern.nyu.edu with any comments or questions. The ROSI Methodology: Making The Business Case For Sustainability. The CSB Return on Sustainability Investment (ROSI) methodology identifies sustainability drivers of financial performance and competitive advantage and monetizes the benefits of sustainable practices. It can be used by any type or size of business as well as investors to better understand the ROI on sustainability and improve decision-making.